What could its length and width be? List at least five different combinations. 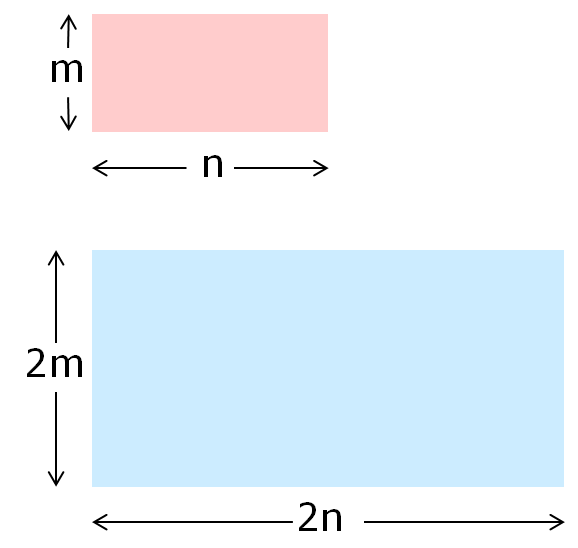 If you enlarge each of your rectangles by a scale factor of 2, what would their new dimensions be? What would their areas be? What happens when you enlarge rectangles with different areas by a scale factor of 2? What if you enlarge them by a scale factor of 3? Or 4? Or 5 ...? Or $k$? What if $k$ is a fraction? Explain and justify any conclusions you come to. Do your conclusions apply to plane shapes other than rectangles? 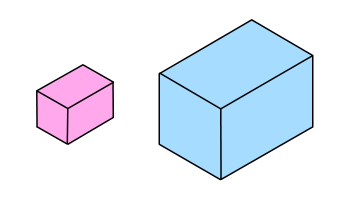 Now explore what happens to the surface area and volume of different cuboids when they are enlarged by different scale factors. Explain and justify your conclusions. Do your conclusions apply to solids other than cuboids? This problem is based on an idea suggested by Tabitha Gould. Generalising. Group worthy. Enlargements and scale factors. Area - triangles, quadrilaterals, compound shapes. Spheres, cylinders & cones. Quadrilaterals. Volume and capacity. Area - squares and rectangles. Surface and surface area. Pythagoras' theorem.